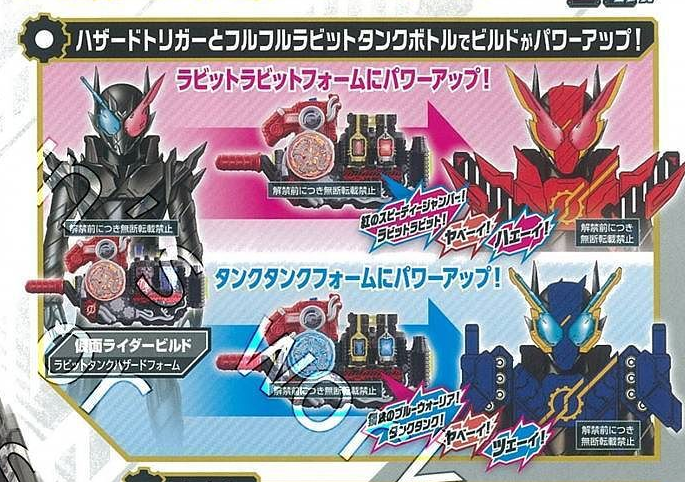 The next quarter of Kamen Rider Build scans have been revealed! As typical with Kamen Rider 3rd quarters there is not much here but still this series continues to be exciting. In February as revealed back in the 2nd quarter Build will gain access to the Hazard Trigger and his new RabbitTank Hazard form. Using the Hazard Trigger with the new DX FullFull Rabbit Tank Full Bottle Build will be able to upgrade to one of 2 new forms. RabbitRabbit and TankTank forms. This toy will come out in March for 2,700 yen. Along with this new form comes a new DX weapon, the DX Full Bottle Buster. This new sword/cannon has the ability to hold 4 Full Bottles to activate the Ultimate Match Break. This toy retails for 5,800 yen and also releases in March. Exciting things coming up for Build here next year. Of course, all these toys will be available on TokuToyStore.com once they release. What do you think of these new Build toys? Is there any you plan on picking up? Leave a comment down below!